This woman’s ceremonial dance skirt from the Kuba people of the Democratic Republic of the Congo reflects the rich artistic textile traditions of a diverse kingdom inhabiting the fertile lands between the Kasai and Sankuru Rivers in Sub-Saharan Central Africa. Kuba cloth is made from woven raffia fiber derived and processed from the Raphia Vinifera Palm. This skirt features a central purple-brown panel with geometric patterning achieved through embroidery and restrained open work. Immediately surrounding this is a dark brown border of plush cut-pile embroidery framed by a ruffled edge made of orange raffia bundled cording. Though lain flat and at rest, the dynamic curved edge treatment lends undulating movement to the otherwise static object. 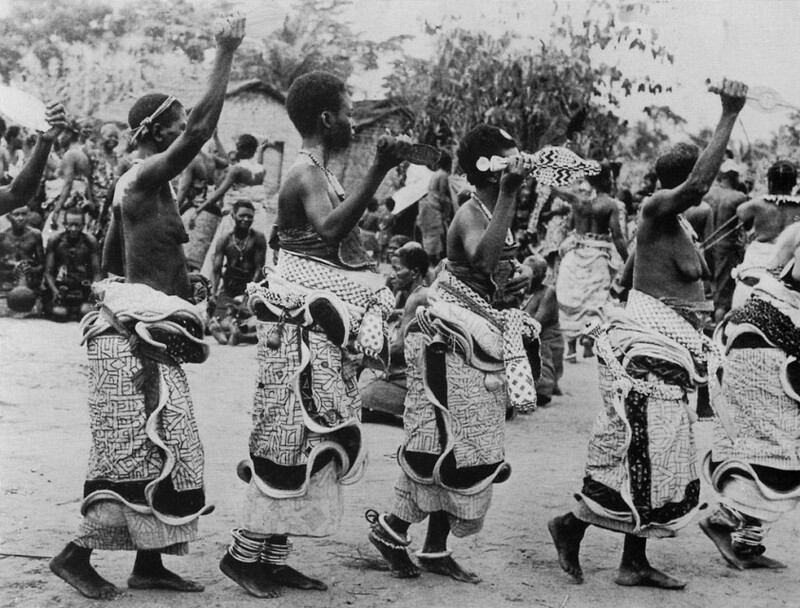 This movement would have been further enhanced when worn during Kuba dance ceremonies such as the itul, a very rare dance festival only held with the king’s permission. As seen in fig. 1, these ceremonial dance skirts are “wound in a spiral around the woman’s body, so that the lower edge of each panel is staggered and exposed beneath the one above it” and held in place by a decorative belt. One important thing to note about this garment is that it was never intended by the Kuba to be viewed flat; since it was only used in key rituals, the skirt was only displayed when worn in the round, wrapped around the body. However, due to its condition and in consideration of its long term preservation, we decided to exhibit and store this object flat. When determining the archival needs of any object, we must consider the best way to preserve its current state by protecting it from undue stress while it is in storage, when it is accessed for research, and when it goes on display. In order to address these three challenges, an archival custom raised mount composed of a padded pillow resting on a lined blue board base was created to lend two levels of support for this object (fig.2). This simple buildup of cushioning evenly distributes the weight of the textile to ensure no areas are under stress. The padded pillow acts as a soft and uniform surface over which the textile drapes, allowing the curled raffia edge to gently rest on the board below. The board also serves as a rigid support by which the object and mount can be lifted, minimizing unnecessary handling of the fragile object. In order to conserve materials, this custom mount will be used for both exhibition display and long-term storage. Fig. 2. View of the custom archival pillow built following the dimensional needs and overall shape of the Kuba skirt. Courtesy of the author. Fig. 3. View of the custom archival box built for the Kuba skirt to be used for storage. Courtesy of the author. After the pillow was constructed, a custom archival storage box was created to accommodate the textile resting flat on its custom mount (fig.3). As is the case with most museums and archives, the object was a victim of storage space restrictions and was previously stored rolled, interleaved with layers of tissue, and supported with a muslin sling. When the textile needed to be removed from the box, it was lifted out using the muslin, unrolled and the tissue stuffing removed. This excessive handling caused additional material breakage, leaving behind broken fibers on the surface of the tissue and muslin sling. Therefore, to address this issue and to minimize future handling, an archival blueboard box was built to store the textile resting flat on its custom mount. Part of the fun of being a student of conservation is having the opportunity to peruse through volumes of objects, discovering something new and unexpected, and finding a way to preserve and share these objects for generations of museum goers to come. This Kuba skirt had all of the hallmarks of an engaging conservation project and it was my deep pleasure and privilege to learn about and care for this object. Watch a video of Ruben and Isabel Toledo reacting to this Kuba skirt. Kyla I. Katigbak hails from the Philippines and loves to research global weaving traditions based on leaf and bast fibers. She earned her BS in Fiber Science and Apparel Design from Cornell University and is scheduled to complete her MA in Fashion and Textile Studies from the Fashion Institute of Technology (FIT) in May 2014. She will be presenting a paper entitled Modern Metropolis: The New York Skyline in Textile Design,1890-1940 at the FIT Graduate Studies Spring Symposium—Modes of Modernity: The Ephemeral and the Eternal in Twentieth Century Fashion, which she is planning to research further as the topic of her graduate thesis. Jay Heale and Jui Lin Yong, The Democratic Republic of Congo, (New York: Marshall Cavendish Benchmark, 1997), 121. Vanessa Drake Moraga, Weaving Abstraction: Kuba Textiles and the Woven Art of Central Africa, (Washington, D.C.: The Textile Museum, 2011), 133.